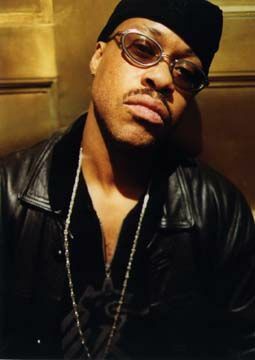 Today a fellow hip-hop head and teacher found me in the library and told me that Guru died. He had been in a coma for a while, which I hadn’t heard about. This really makes me sad. Guru (who described his name as representing “Gifted Unlimited Rhymes Universal”) was one of those rare talents in the world of hip-hop: An intelligent, loving, and powerfully enlightened soul who created positive, funky-beyond-words music. I was never a huge fan of Gang Starr, his first group, but since the first time I heard his first Jazzmatazz project, I knew it was something very special. I’ve had my eyes opened to a number of magnificent jazz greats through those albums, and his lyrics have always combined a syrup-smooth flow with masterful music production. And he said things worth saying — a sadly rare phenomenon these days. Guru himself was always about maximizing one’s time on the planet, drinking fully from the font of each day, and never wallowing in despair. So it’s only fitting that we listen, then, to his track “Lifesaver” from the second Jazzmatazz album. Is this the end? Or a new beginning? Indeed. Sarah PAC spent another $8,000 on colorful bookmarks designed by a Nashville-based event branding firm. I know Christmas isn’t for eight months — and my birthday is even further away. But if anyone ever comes across one of those for sale cheap, I will pay you $20 to add that baby to my bookmark collection. I still haven’t seen Avatar, and — since the 3D IMAX special effects were the only thing that really interested me — I probably never will. However, I will give credit where it’s due. Lest you think James Cameron is only about a feel-good “going native” story without any political awareness of the real-world counterpart: He went to Brazil last week to protest a dam in the Amazon Jungle. So while the movie looks dumb, at least he’s willing to walk the walk. But what about internet petitions? (Worst transition ever.) I found myself signing one recently, and I wondered if there were any research on their effectiveness. I didn’t exactly find any, but as usual, Snopes had something worth saying. In a world beset by complex problems, the solutions of which will take enormous amounts of time, money, and commitment, such simplification as the e-petition provides a welcome relief. Imagine having the power to solve those problems! Moreover, imagine having it merely at the click of a mouse! Recently on the news I heard someone say “Tiger Woods’ future is uncertain.” This is moronic. Every person’s future is uncertain. We could have an esoteric debate about the Arrow of Time, but for all practical purposes, we don’t know what the future will bring! For anyone. Or anything. End of story. Stop saying meaningless things! Copps Supermarket sometimes plays some weird songs on the sound system. One time it was “Missing” by Everything but the Girl. (The only time I’ve ever sung along with a supermarket sound system.) Last week, as I heard Peter Cetera coming in loud and clear, a thought occurred: “Glory of Love” might have been Mr. Cetera proclaiming his love for a judge! Think about it. I bet you never hear that song the same way ever again! An interesting collection of “Things, But Very Slowly”. Today I’m listening to: Computer Rockers! I’m really sick of this. Every time a mine disaster happens and fifteen poverty-stricken people — who work harder every single day of their lives than I will ever work in an entire week — die a slow death from gas or starvation or being crushed by rocks (instead of a much slower death from black lung), I immediately think: I wonder how many criminal fines and negligent safety violations the company was guilty of last year? Well, in the case of Massey Energy in 2009, the answer was $382,000. And get this: The mine in Montcoal (I swear that’s really the name of the town) had been cited in years past for improper methane ventilation — which is probably what killed the 25 miners this time. It’s a pathetic commentary on the criminal passivity of the American people — and the energy corporations who feed us — that we allow these mining companies to cut so many corners on safety, when the inevitable result is this kind of death and suffering and tragedy. When the free market leads over and over to this sort of bloodshed, it’s a broken system. Period. Tonight Diane and I are staying home instead of going to see Noam Chomsky live in concert. It feels silly to say that I’m just really tired, but dammit, I’m really tired! And there’s a very good chance that I will be able to either (A) predict with creepy accuracy or (B) find online most of what Prof. Chomsky will say in his talk. “But the 9/11 conspiracy questions!” People are saying. “You won’t have to listen to him fend off the 9/11 conspiracy people!” Yeah, well, I can tune into WORT for that. So then I wonder why I’m not getting any real comments. I suppose it could be because I post so sporadically. Or maybe the WordPress system is more arduous than what I had on the old site. Or maybe people don’t know that I moved over (they subscribed to RSS and missed the post about moving)? Then I thought about how I post most stuff to Facebook and it’s only when I have a political rant or something Sarah Palin-related that I write here at all. Also, I’m so often worn out from school that I don’t always have lots of energy for this ‘Napse of mine. Oh, well. Here’s something Sarah Palin-related: JaySmooth from NilDoctrine talking about her. And that’s not even the TimeWaster™! Check out Pixels, an amazing blend of CG and real-life film. Just magnificent! Today I’m listening to: SomaFM!